We at the Forgotten Founders Corporation were pleased that the FIFTH Circuit United State Court of Appeals remanded the with prejudice lower court dismal of our case back to the United States District Court of Middle Florida to be dismissed without prejudice due to standing issues. The good news is, this ruling overturning the lower court's prejudice dismissal enabled us to re-file a Writ of Mandamus against the Secretary of the Treasury fully addressing the standing issue brought forth by the defendant's legal team. The $1 Presidential Coin Act of 2005 expressly precludes the Presidents of the Continental Congress from being honored on the dollar coin. Unlike the Articles of Confederation Presidents, these men were not Presidents of the United States under a federally ratified constitution. We believe that Presidents of the Continental Congress Peyton Randolph, Henry Middleton, John Hancock, Henry Laurens, John Jay and Samuel Huntington should also be honored along with the Presidents of the United States who served under both 1777 and 1787 U.S. Constitutions. To accomplish this we must either seek to amend the $1 Presidential Coin Act of 2005 ordering all United Colonies and United States Presidential images be included on the new Dollar coins or propose a new Presidential Coin Act for an entirely different Coin. The dollar coin program is NOW well into the minting of the Constitution of 1787 Presidents and an amendment to the $1 Coin Act would only disrupt an already struggling program. In light of the above, we are decided to follow U.S. District Judge Steven D. Merryday’s advice to pursue the recognition of the early Presidents legislatively. The proposed U.S. Founding Half-Dollar Coin Act serves the purpose of acknowledging the unicameral United Colonies and United States Presidency which began in 1774 and faded away in 1789. This U.S. Founding Half-Dollar Coin Act, if enacted, this Act will go a long way to right U.S. Presidential History while accenting the $1 Presidential Coin Act of 2005. The U.S. Founding Half-Dollar Coin Act has been submitted to President Barack H. Obama, Secretary of the Treasury Timothy Geithner, and the members of the U.S. Senate Banking Committee where the $1 Presidential Coin Act of 2005 honoring the Presidents of the Constitution of 1787 originated. Bill Stanley of the Norwich Historical Society and Channing Huntington of the Huntington Homestead Museum in Connecticut are working directly with U.S. Senate Banking Committee Chairman Christopher Dodd’s office. Thanking you in advance for your consideration and support our efforts to pass the U.S. 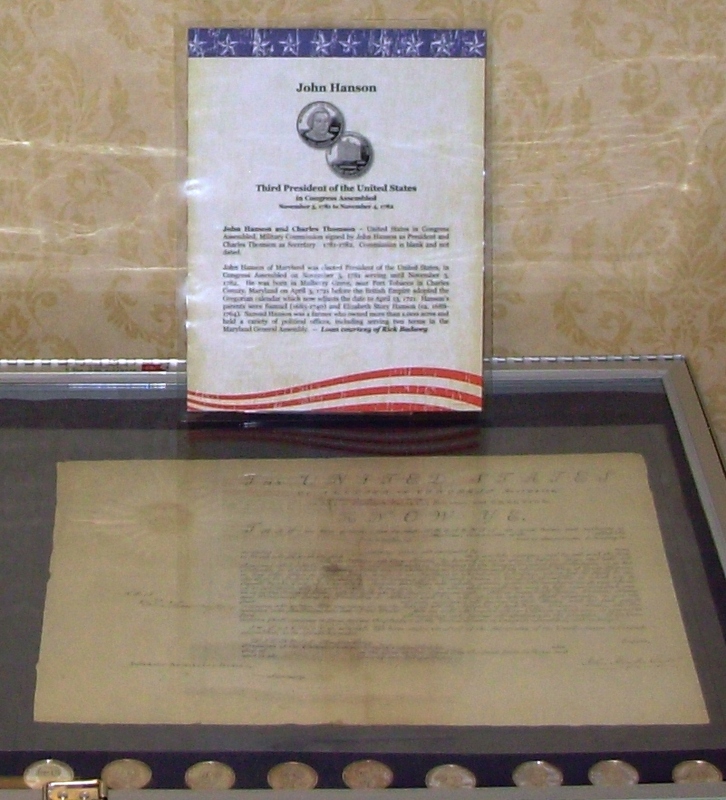 Founding Half-Dollar Coin Act. What happened to the case history on the Klos vs. Paulson $1.00 Presidential Coin Act of 2005 Complaint? The complete transcript of the case and its exhibits follows these FAQs. Why the Kennedy Half-Dollar, won't this upset JFK supporters ? Like the Sacagawea Gold Dollar, The John F. Kennedy Half-Dollar will return once the minting of the Founders and their Capitols are complete. Unlike the Sacagawea Gold Dollar, the program will not last a score of years. The U. S. Founding Half Dollar Coin Act is proposed to run only four years and then return to the John F. Kennedy Half Dollar. Finally, knowing President Kennedy's love for history we believe true JFK advocates will support this tribute to the U.S. Founding Presidents and their Capitols. 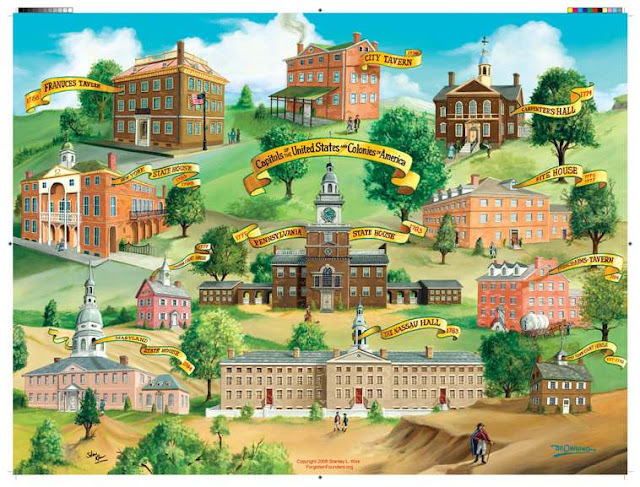 Why include all the old U.S. Capital buildings on the reverse with the names of events that in their cities and towns? People are unaware that the United Colonies and States of America had numerous seats of governments from 1774 to 1788. Additionally, most U.S. Citizens do not realize the scope of legislation enacted during this period, such as the Articles of Confederation, Definitive Treaty of Peace Between Great Britain and the United States, Northwest Ordinance and US Constitution of 1787. This legislation as well as hundreds of laws, resolutions and proclamations were all enacted in capitol buildings many years before Washington DC was even conceived. The capitol buildings on the Reverse are paired to the appropriate Presidencies on the Obverse giving the holder a sense of who the President is, when he served, what legislation his Congress enacted, where and in what building Congress convened. HENRY M. PAULSON, JR., in his capacity as Secretary of the Treasury, Defendant. Pursuant to the mandate (Doc. 19) of the United States Court of Appeals for the Eleventh Circuit, the plaintiff’s complaint is DISMISSED WITHOUT PREJUDICE. ORDERED in Tampa, Florida, on April 1, 2009. Before TJOFLAT, DUBINA and HULL, Circuit Judges. Stanley Klos filed a pro se complaint seeking a declaration, pursuant to 28 U.S.C. 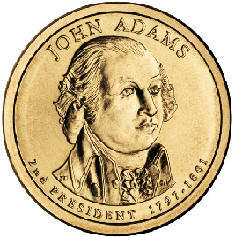 § 2201, that the term "Presidents of the United States" within the meaning of the Presidential $1 Coin Act of 2005, Pub. L. No. 109-145, 119 Stat. 2664, codified at 31 U.S.C. § 5112(n) ("the Coin Act"), includes the ten men who served under the Articles of Confederation as the President of the United States in Congress Assembled. Pursuant to the Mandamus Act, 28 U.S.C. § 1361, Klos's complaint also sought an order directing the Secretary of the Treasury to issue one dollar coins bearing the names and likenesses of these ten men. The district court granted the government's motion to dismiss for failure to state a claim, filed pursuant to Federal Rule of Civil Procedure 12(b)(6). The district court concluded that the Coin Act does not require the Secretary to issue such one dollar coins and, thus, Klos had no cognizable right to relief under § 1361 or § 220l. We agree with the government that the allegations in Klos' s complaint, taken as true, do not establish Article III standing 1. See Stalley ex reI. United States v. Orlando Reg'l Healthcare Sys., Inc., 524 F.3d 1229, 1232 (lIth Cir. 2008) (explaining that plaintiff's complaint must allege, inter alia, "an injury in fact - a harm suffered by the plaintiff that is concrete and actual or imminent, not conjectural or hypothetical" to establish Article III standing). Accordingly, we do not address the merits of Klos's claims. We vacate the district court's July 14, 2008 dismissal order, however, with instructions to dismiss Klos's complaint without prejudice. See id. (explaining that a dismissal for lack of standing has the same effect as a dismissal for lack of subject matter jurisdiction under Rule 12(b)(1) and thus is entered without prejudice). 1 Because standing is a jurisdictional requirement we must address sua sponte, the government's failure to raise the standing issue in the district court does not impede our ability to consider the issue for the first time on appeal. See Region 8 Forest Servo Timber Purchasers Council V. Alcock, 993 F.2d 800, 807 n.9 (11 th Cir. 1993). "[W]hen standing is questioned for the first time by an appellate court, standing must affirmatively appear in the record. ", Id. at 806 (quotation marks omitted). In response to the government's standing argument, Klos did not move to supplement the record or amend his complaint (or even contend that he has standing). Thus, the only allegations of standing in the record are found in Klos's complaint. Jennifer W. Corinis, Assistant United States Attorney of Counsel, for Huey-Ling Nie, United States Mint Director and Henry M. Paulson, Secretary Of The Treasury. The Appellant submits that oral argument would be helpful and the decisional process would be significantly aided by its allowance. This request is made pursuant to Fed R. App. P. 34(c) and 11th Cir. R. 28-2(c). The United States Court Of Appeals for the Fifth Circuit has jurisdiction over the appeal. The 11th District Court of Middle Florida has subject matter jurisdiction over this action pursuant to 28 U.S.C. Sections 1361, 1331, and 2201. Venue was proper in this Middle District of Florida pursuant to 28 U.S.C. Section 1391(e). 1. Whether the district court erred in refusing to hear and dismissing the Appellant’s writ of mandamus with prejudice. 2. Whether the district court erred in ruling the Motion for Reconsideration as a motion pursuant to Rule 60(b), Federal Rules of Civil Procedure (1), for relief. 3. Whether the appeals court should order the judiciary to interpret the meaning of the term “president” in the Presidential Coin Act before determining whether mandamus will lie. The threshold issue is whether the district court abused its discretion in dismissing this case that involves claims for declaratory and mandamus relief against the Secretary of the Treasury, pursuant to 28 U.S.C. Sections 2201 and 1361. Specifically, Appellant sought the entry of an order compelling the Secretary of the Treasury to comply with the requirements of the Presidential $1 Coin Act of 2005 (the “Presidential Coin Act”), 31 U.S.C. Section 5112, by minting coins bearing the images of Presidents Samuel Huntington, Thomas McKean, John Hanson, Elias Boudinot, Thomas Mifflin, Richard Henry Lee, John Hancock, Nathaniel Gorham, Arthur St. Clair and Cyrus Griffin (collectively, the “Constitution of 1777 Presidents”). The District Court, despite numerous directives in the Presidential Coin Act to mint coins for ALL of the deceased U.S. Presidents, wrongly decided the Constitution of 1777 Presidents where excluded from the Act as the bill stated “…beginning with President George Washington…” which, because of the Court’s understanding of U.S. History and the evolution of the U.S. Presidency, was wrongfully ordered that this sole clause meant that the “Coin Act neither requires nor authorizes the Secretary to issue a coin bearing the image of each “Constitution of 1777 President” (ER Tab 8:08-cv-00843-SDM-TBM , 07/14/2008 Order pages 3 and 4) dismissing the complaint with prejudice. The second issue is whether the district court erred in ruling the Appellant’s “Motion for Reconsideration" as a motion pursuant to Rule 60(b), Federal Rules of Civil Procedure (1), for relief. The third issue is that the district court erred by not addressing the meaning of the term “president” in the Presidential Coin Act before determining whether mandamus will lie. 05/01/2008 Stanley L. Klos was plaintiff in one lawsuit against defendant, HENRY M. PAULSON, JR., in his capacity as United States Secretary of the Treasury. The Complaint seeking the Court to compel the Secretary of the Treasury to comply with the requirements of the Presidential $1 Coin Act of 2005 was filed on May 1, 2008. 5/5/2008 A NOTICE of designation under Local Rule 3.05 - track 1, Signed by deputy clerk on 5/5/2008. 06/19/2008 Submitted Motion to Dismiss by JENNIFER W. CORINIS, Assistant United States Attorney for Secretary Paulson. 7/07/2008 RESPONSE to motion re: MOTION to dismiss Complaint filed by Stanley L. Klos. 7/14/2008 ORDER granting --motion to dismiss; dismissing action; directing the Clerk to TERMINATE any pending motion and CLOSE the case, Signed by Judge Steven D. Merryday. 08/01/2008 Resubmitted MOTION for reconsideration re: Order on motion to dismiss by Stanley L. Klos. 8/12/2008 ORDER denying --motion for reconsideration, Signed by Judge Steven D. Merryday. 08/13/2008 Submitted Appeal of: ORDER: DISMISSED WITH PREJUDICE for failure to state a claim on which relief can be ORDERED in Tampa, Florida, on July 14, 2008. 08/12/2008 - ORDER: Denying the “Motion for Reconsideration" construed by the Court as a motion pursuant to Rule 60(b), Federal Rules of Civil Procedure ORDERED in Tampa, Florida, on August 12, 2008. Stanley L. Klos, the Appellant, resides in Pinellas County, Florida with four of his eight children. Three of the children residing with Mr. Klos are minor. Klos is a historian, author, entrepreneur, and former Italian basketball player. He was the Republican Nominee who challenged Robert C. Byrd running for the United States Senate in 1994. 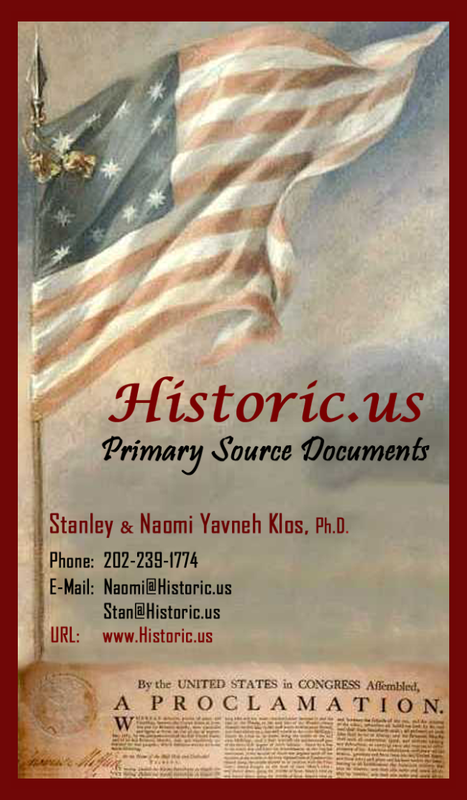 Klos is an exhibitor and researcher of rare historical documents specializing in the 1774 – 1789 founding period of the United States. He has written numerous publications and assembled exhibits that have headlined a plethora of universities, national historic sites, libraries, museums and special events. Most recently, he was invited to exhibit at both the DNC and RNC political convention venues. He has keynoted historical events including the Franklin D. Roosevelt American Heritage Center Museum Grand Opening and the 2003 re-entombment of Martha and Samuel Huntington who were the First Lady and First President of the United States under the Constitution of 1777. Stan’s work has appeared in hundreds of print and digital publications including U.S. News & World Report 2006 cover story, Washington? Get In Line" and the Discovery Channels Unsolved History: Plots To Kill Lincoln. The Appellant brought about this complaint due to the 2005 Presidential Coin Act its damaging effects on his children, the children of the United States, his business and the citizenry’s understanding the of the founding and legal evolution of the U.S. Presidency. FACT: The Articles of Confederation were a thirteen state ratified federal constitution forming a “Perpetual Union between the states of New Hampshire, Massachusetts-bay Rhode Island and Providence Plantations, Connecticut, New York, New Jersey, Pennsylvania, Delaware, Maryland, Virginia, North Carolina, South Carolina and Georgia” with the “Stile of this Confederacy” being “The United States of America”  passed on November 15, 1777, hence the name Constitution of 1777. 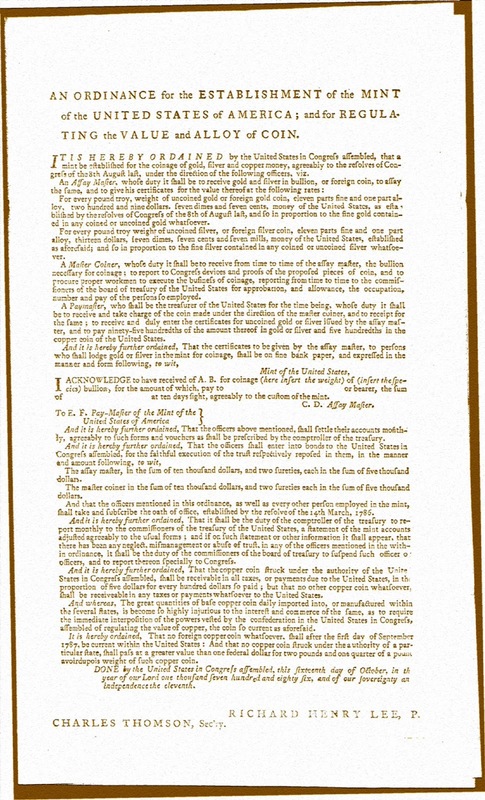 On a final fact regarding this matter of the Articles of Confederation being the first “federal constitution” of the United States of America, I ask that the Honorable Court consider the legislation that led to the second “federal constitution” of the United States from which, they draw the authority and hear this case. 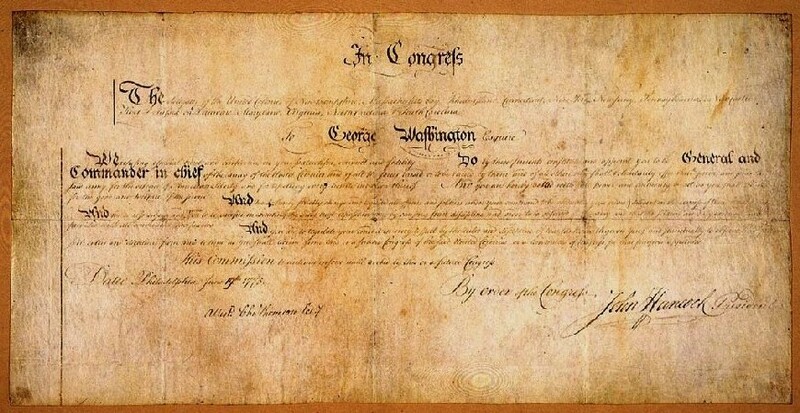 FACT: On March 1, 1781 the last state, Maryland, reported their ratification to the Continental Congress which enacted the Constitution of 1777 dissolving their body and replacing it with the unicameral entity called the United States, in Congress Assembled. (Exhibit B). 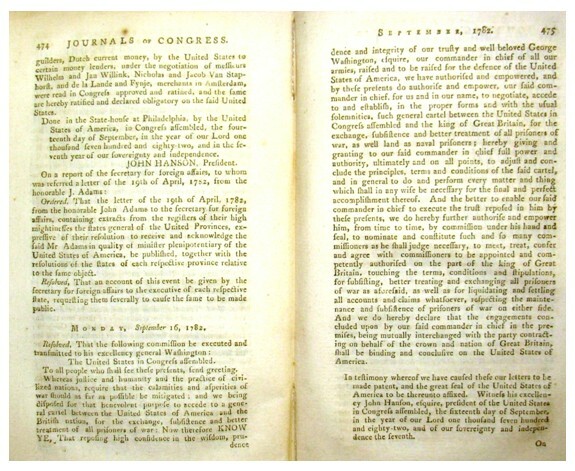 FACT: On March 2, 1781 the Journals of the Continental Congress were changed to the Journals of the United States, in Congress Assembled and Samuel Huntington was recorded as the new federal government’s President (Exhibit C). FACT: Nine Presidents of the United States, in Congress Assembled followed Samuel Huntington: Thomas McKean, John Hanson, Elias Boudinot, Thomas Mifflin, Richard Henry Lee, John Hancock, Nathaniel Gorham, Arthur St. Clair and Cyrus Griffin (collectively, the“Constitution of 1777 Presidents”). FACT: Each of the ten Presidents had spouses and their names in order of their husband’s service are: Martha Devotion Huntington, Mary Borden Sarah Armitage McKean, Jane Contee Hanson, Annis Stockton Boudinot, Sarah Morris Mifflin, Elizabeth Eskridge Lee, Dolly Quincey Hancock, Rebecca Call Gorham, Phoebe Bayard St. Clair, and Lady Christine Stewart Griffin. 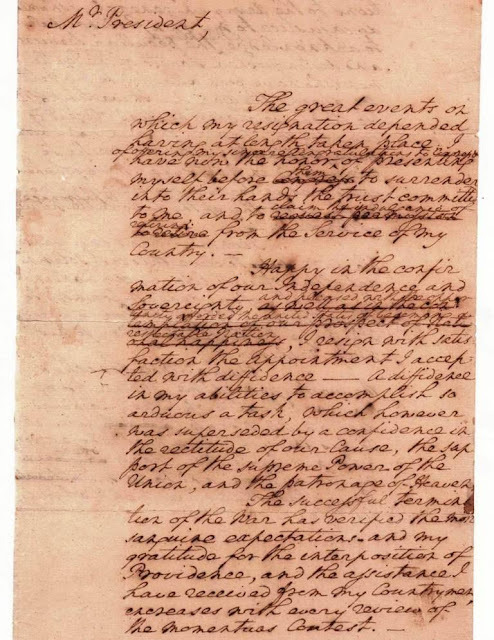 After review of their letter, the Appellant realized that the Treasury and perhaps even Congress did not understand that the Articles of Confederation was the first federal U.S. Constitution. The Appellant chose not to pursue this oversight of the Articles of Confederation as a federal constitution in the District Court as which state was first, Delaware or Virginia. The Appellant deemed this historical error of not significant magnitude to harm his children, fellow U.S. Citizens or his rare document and exhibit businesses. The omitting of the Constitution of 1777 Presidents on U.S. $1.00 Coinage and the keeping of the error that the United States Presidency began with the Second U.S. Constitution is, however, quite a different matter. The final facts the Appellant brings in this section before the honorable court is first, the Articles of Confederation in Article II places a comma after states “not by this Confederation expressly delegated to the United States, in Congress assembled.”  Second, the Senate and House of Representatives of the United States of America, as evidenced in both the State Quarter and Presidential Dollar Coin Acts, add “in Congress assembled” to their legislation. The point is that the people of the United States do not refer to the Honorable Nancy P. D. Pelosi as the Speaker of the House of Representatives of the United States of America in Congress Assembled but as the Speaker of the United States House of Representatives. The people do not refer to her as the Speaker of United States in Congress Assembled House of Representatives but as the Speaker of the United States House of Representatives. Likewise, the people do not refer to the Honorable Richard B. Cheney, in his legislative capacity, as the President of the Senate of the United States of America in Congress Assembled but as the President of the Senate of the United States of America. The people do not refer to him as the President of the United States in Congress Assembled Senate but as the President of the United States Senate. Consequently, Samuel Huntington and the other nine men holding the office of Presidents of the United States in Congress Assembled were often refereed to as Presidents of the United States as well as Presidents of Congress in the unicameral federal government. In the current tri-parte system the U.S. House and U.S. Senate in the legislative branch, the Supreme Court in the judicial branch and the President /Commander-in-Chief in the executive branch form the government of the United States of America. Under the first constitution, the United States in Congress Assembled, in its unicameral structure, formed the government of the United States of America. The entire core of this case is that the current Congress and sitting President of the United States enacted a $1.00 Coin program honoring “each of the Nation's past Presidents” of the United States and their spouses thereby including the Constitution of 1777 Presidents. The case that these Constitution of 1777 Presidents were Presidents of the United States and rightfully should be so honored as per the language of the “Presidential Coin Act” merits a hearing and oral argument before the 11thDistrict Court of Appeals, a judiciary that derives its very existence from the second United States Constitution forged by these men from failed political systems spanning 15 years. 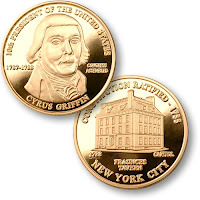 “Because the Coin Act neither requires nor authorizes the Secretary to issue a coin bearing the image of each “Constitution of 1777 President” the complaints asserts no cognizable right to relief under 28 U.S.C. § 1361 and declaratory relief 28 U.S.C. §2201 is appropriate.” (ER Tab 8:08-cv-00843-SDM-TBM , 07/14/2008 Order pages 3 and 4). The Appellant sees this “beginning with President George Washington” clause as not conflicting with the Appellant’s request for relief, namely ordering the Secretary of the Treasury to include the Constitution of 1777 Presidents into the $1.00 Coin minting. Additionally, supporting the Appellant’s case is that the legislation was ultimately designed to correct the fact that “Many people cannot name all of the Presidents, and fewer can name the spouses, nor can many people accurately place each President in the proper time period of American history.” (Public Law 109-145 SEC 101 Findings (8) ). Since George Washington was both a President and Commander-in-Chief and the Coin Act’s language “beginning with President George Washington” places him in the proper lineage of history at the head of the Constitution of 1777 Presidents. It is therefore proper, especially under the Constitution that melded both offices, to begin with the minting of the $1.00 Coins with George Washington. First, faced with a Federal Rule of Civil Procedure 12(b)(6) motion to dismiss a §10(b) action, courts must, as with any motion to dismiss for failure to plead a claim on which relief can be granted, accept all factual allegations in the complaint as true. See Leatherman v. Tarrant County Narcotics Intelligence and Coordination Unit, 507 U. S. 163. To determine whether the plaintiff has alleged facts giving rise to the requisite “strong inference,” a court must consider not only the above facts but plausible, nonculpable explanations, (i.e. George Washington being selected as the first coin as he was a President of the United States and in from 1775 to 1783 the first Commander-in-Chief of the United Colonies and States of America which is, by most historians account, the more important office in the executive branch created by the Constitution of 1787) as well as inferences favoring the plaintiff. The Coin Act’s requirement that the coins be issued “in the order of the period of service of each President, beginning with President George Washington” strongly supports the defendant’s contention, and the plaintiff offers no convincing argument, explanation, or citation of authority to support a contrary interpretation of the statute. Because the Coin Act neither requires nor authorizes the Secretary to issue a coin bearing the image of each “Constitution of 1777 President,” the complaint asserts no cognizable right to relief under 28 U.S.C. § 1361 and declaratory relief under 28 U.S.C.§ 2201 is inappropriate (ER Tab 8:08-cv-00843-SDM-TBM , 07/14/2008 Order pages 3 and 4) . This issue, a requirement that the coins are to be issued “in the order of the period of service of each President, beginning with President George Washington” is not the only language in the act that could be argued relieves the Secretary of the Treasury from the duty “to mint coins in commemoration of each of the Nation's past Presidents and their spouses.” Whether George Washington first Commander-in-Chief status met the meaning of “beginning with President George Washington” was not even considered in the context of the District Court granting the motion to dismiss. This clause, in the Commander-in-Chief context, required consideration as this was an office held by George Washington before the Constitution of 1777 Presidents. The fact that the Appellant’s writ of mandamus was dismissed with prejudice on this clause and some inference made that the Constitution of 1777 Presidents were not true Chief Executives is in error. Even in the specious, singular context of this five-letter clause the Appellant’s case was more than merely “reasonable” or “permissible,” but it was cogent and compelling and strong in light of other explanations. It should not have been dismissed. Fourth: This complaint should survive and the Order of Dismissal overturned as a reasonable person would deem the inference of plaintiff cogent and at least as compelling as any plausible opposing inference, “beginning with President George Washington” one could draw from the facts alleged. -- TELLABS, INC., et al. v. MAKOR ISSUES & RIGHTS, LTD., et al. Sixth: This complaint should survive and the Order of Dismissal overturned as the Coin Act does not state even one name clearly defining the order of Presidential coins after George Washington. “This fact only underscores the Court's duty to refrain from reading into the statute a phrase that Congress has left out – (ie John Adams, Thomas Jefferson … or Samuel Huntington, Thomas McKean …). The Court and Defendant’s reasoning “is no more availing, since Congress expressed no clear intent” that permit the defendant to discount the numerous requirements in the Act to mint coins of each of the Presidents and their spouses and dismiss this Writ of Mandamus. Keene Corp. V. United States, certiorari to the united states court of appeals for the federal circuit, Supreme Court: No. 92-166. Argued March 23, 1993, Decided May 24, 1993. Seventh: This complaint should survive and the Order of Dismissal be overturned as the District “Court cannot say beyond doubt that” Mr. Klos “can prove no set of facts that would entitle him to relief.” On the contrary, the Appellant illuminated more then a reasonable doubt on the “beginning with President George Washington” clause which was the District Court core reason for dismissing the Writ of Mandamus against the Secretary of the Treasury. Davis, As Next Friend Of Lashonda D. V. Monroe County Board Of Education Et Al., Certiorari To The United States Court Of Appeals For The Eleventh Circuit, Supreme Court Of The United States, No. 97—843. Decided May 24, 1999. Teal v. Eagle Fleet Inc., 933 F.2d 341, 347 (5th Cir. '1991); '12 James Wm. Moore et al, Moore's Federal Practice § 59.30 (A motion for reconsideration filed more than 10 days after entry of judgment is treated as a motion seeking relief from judgment under Rule 60(b},"). The District Court issued their ruling on July 14, 2008 and notified the defendant by electronic mail on said date. On July 14, 2008 the Appellant attempted to retrieve the order electronically. The system permitted access, the pdf of the order appeared on the screen; and when the Appellant went to print the order, he was kicked off the electronic website. The Appellant was not granted access to the site again receiving the order via email from the Tampa Tribune who sought his comments. The Clerk did not return his calls. Despite this, the Appellant drafted a Motion for Reconsideration from the order submitted to him by the Press. The motion was completed and the Appellant attempted to submit it electronically but was denied access. The motion was mailed on July 22, 2008, from Palm Harbor, Florida to Clerk of the District Court in Tampa, Florida, along with the certificate of service of motion to the defendant’s numerous parties who also received a copy of the motion to reconsider. The District Court never responded to the USPS mailed motion, nor did the Court mail the Appellant a copy of the July 14th, 2008 order. On August 1st, 2008, the Appellant drove to the Clerk of the District Court’s office to get an official copy of the July 14th order, find out why the Appellant was banned from the electronically filing the Motion to Reconsider, why no order was sent and why there had been no communication from the Clerk. He was told that once a case is closed, Pro Se parties immediately loose access to the electronic filing system. The Assistant Clerk didn’t know why his calls were not returned and found that the Appellant’s Motion for Reconsideration was not filed. The Appellant was then told the processing clerk on this matter was on vacation and that he could file the copy of his motion of reconsideration that he had presented to the clerk from his file. The Appellant took the copy, added an original signature and filed on the 1st of August. He requested the vacationing clerk call him about the non-filed July 21st Motion for Reconsideration. No call was ever received. The Appellant maintains that the Clerk of the District Court erred in the timely filing of the Motion to reconsider and that he met the 10 day required filing period. 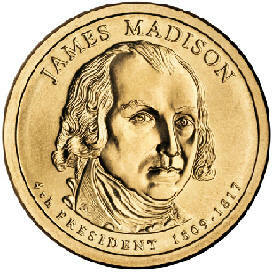 There is no question that the first $1.00 coin should start with President George Washington. George Washington was not only the first President under the 1787 Constitution of the United States but he was also the only Commander-in-Chief of the United Colonies of America under the 1774 Articles of Association as well as the First Commander-in-Chief under the Constitution of 1777 (See Exhibit E). The Constitution of 1787 combined both of the offices of Commander-in-Chief and U.S. President. The Constitution of 1777, however, recognized the separation of the two offices until December 23, 1783 when Commander-in-Chief Washington resigned his office to President of the United States Thomas Mifflin (Exhibit F), a former Revolutionary War Major General. 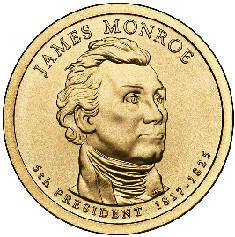 It is therefore prudent in that the Act start the minting of the coins with President Washington as the first Commander-in-Chief as well as issue a second coin for the“Father of Our Country” as President/Commander-in-Chief as per 3B ii of the Bill “NONCONSECUTIVE TERMS - If a President has served during 2 or morenonconsecutive periods of service, a coin shall be issued under this subsection for each such nonconsecutive period of service.” In short, George Washington served in two nonconsecutive terms as Commander-in-Chief which, the Constitution of 1787 defines, and what many historians argue, is the most important executive duty of the U.S. Presidency as well as the co-title for the current executive branch of the United States of America. It is the Appellant’s contention that after the minting George Washington’s Commander-in-Chief Presidential Coin (Service from 1775-1783 – see Exhibit G) the Secretary should have moved on to minting the coins of the Constitution of 1777 Presidents (Exhibit H) until the minting of the 12th coin which would be for George Washington (Service from 1789 to 1797) as the President and Commander-in-Chief under the Constitution of 1787. The Appellant maintains that the language “beginning with President George Washington” in this Act, therefore, in no way precludes the Secretary of the Treasury from issuing coins for Constitution of 1777 Presidents. In fact, with the phrase “beginning with President George Washington” now understood in its proper historical context, the remaining language in the Act requires the Secretary of the Treasury to mint dollar coins for all Constitution of 1777and 1787 Presidents. More importantly, nowhere in the Bill does the law preclude the honoring of the Constitution of 1777 Presidents. The Defendant’s position that “The historical contentions set forth by the Plaintiff in his Complaint as to whether the Constitution of 1777 Presidents served in the same capacity as President George Washington and his successors are immaterial in this matter” is fallacious as it was never alleged that the office had the same capacity. Additionally, the fact that these Constitutions of 1777 Presidents are or are not Presidents of the United States is at the very core of this case. The minting of Constitution of 1777 Presidents coins is further supported by Section 8 of the Coin Act Bill stating – “Termination of program. 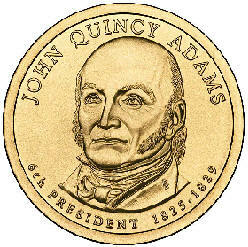 -- The issuance of coins under this subsection shall terminate when each President has been so honored, subject to paragraph (2) (E), and may not be resumed except by an Act of Congress.” If the Court finds these men were not Presidents of the United then and only then is the Secretary of the Treasury released from his burden to mint Constitution of 1777 Presidents $1 Coins. An April 1, 2008, letter from Patrick M. McAfee, the Director of the “Office of $1 Coin Programs,” to the plaintiff (Doc. 1-4) plausibly explains why Congress excluded the “Constitution of 1777 Presidents”: although the “Constitution of 1777 Presidents” “were known as ‘Presidents of the United States in Congress Assembled,’” “[a] president in this role functioned exclusively under the sponsorship of, and in service to, the Congress. He was the presiding officer of Congress, chaired the Committee of the States . . . when Congress was in recess, and was responsible for other administrative duties. His role was not as a chief executive in the way the Presidents of the United States from George Washington to the present have been. 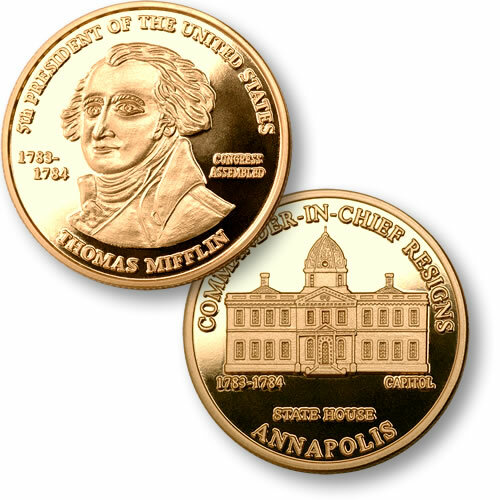 Nowhere in the Coin Act does the Congress ever address the title or duties of Chief Executive to be a pre-requisite of minting the $1 Presidential coins. Nowhere in the Coin Act does Congress provide any criteria to exclude the Constitution of 1777 Presidents. Moreover, these Presidents utilized their office to exercise much influence on United States public affairs and legislation. It is argued in this brief, and hopefully in oral argument, that in many instances the Constitution of 1777 Presidents exercised more potent federal powers then the Constitution of 1787 Presidents. For example, under Article V of the Constitution of 1777, “In determining questions in the United States in Congress assembled, each State shall have one vote,”the Presidents were often the only delegate representing their entire State. In the unicameral Federal Government the President while presiding over Congress (much like today’s Speaker of the House) casted a vote for their State in quorums as small as seven enacting binding legislation. This means that the Constitution of 1777 Presidents’votes, while chairing the unicameral Congress, more often represented not 1/13th but 1/12th to 1/7th off all ballots required to pass a law. 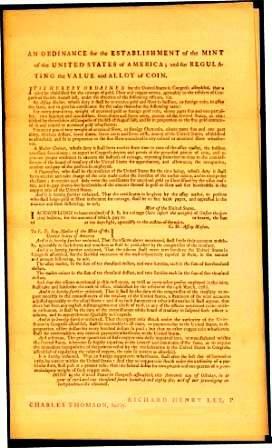 For example, one of the most important pieces of legislation ever to be enacted in the United States of America, the Northwest Ordinance,  only eight states were present during this bill’s passage. In the case of enacting legislation, is not the Constitution of 1777 Presidential office a more potent political position then that of President George W. Bush? In the case of the Coin Act, after two legislative houses, with 535 potential votes, labored for over a year to pass the bill under the Constitution of 1787 the President’s true power was limited to a veto. Which office was politically more powerful in enacting legislation? Presiding over a unicameral government and having 1/7th to 1/13th of all votes required to pass a law or having 2/3rd’s veto power over a bill that may be declare unconstitutional by yet a third branch of government? The Constitution of 1777 Presidents performed legislative duties similar to the Speaker of the House but they had no 2nd legislative body to check their laws or an executive branch to veto their Bills. Moreover, since there was no executive or judicial branch the President often took on the duties of the Head of State and Supreme Court Justice. Who did Commander-in-Chief George Washington report to in the Confederation government? After Washington resigned, who assumed the duties of Commander-in-Chief when incidents like Shays Rebellion or Northwest territorial military action occurred? The speculation of why the current United States in Congress Assembled acted as they did is most interesting. Under which case law are speculations for the actions utilized by the District Court to deny a hearing and dismiss such a historically important case with prejudice? · The Presidents had the power to call for the unicameral government’s assembly and adjournment. · The Presidents issued military orders (President John Hanson - September 7, 1782 Military directive to George Washington - Exhibit I,), signed military commissions, (President Samuel Huntington Exhibit J), President Elias Boudinot – Alexander Hamilton’ Commission Exhibit K,), Diplomatic Commissions (President Thomas McKean, September 7, 1781 Commission of Joseph de l” Etombe Exhibit L,), treaties (Thomas Mifflin – ratifying the 1783 Treaty of Paris Exhibit M ), proclamations (Cyrus Griffin – September 5, 1788, Cherokee Proclamation Exhibit N), and resolutions (as Richard Henry Lee - October 16, 1786 Ordinance Establishing the U.S. Mint Exhibit O). · The Presidents received, read, answered, and at their own discre­tion held or disseminated the official state and foreign correspondence to the United States. · The President chaired the Committee of the States that governed the United States of America when the United States in Congress Assembled was not in session. · They received both United States and foreign dignitaries when they arrived at the Capitol as the Head of State for the United States of America extending the nation’s official hospitality. · The Presidents acted similar to Supreme Court Chief Justices presiding over cases such as Federal Court Appeals, Death Penalty Appeals, Military trials and State boundary disputes. As stated, despite the Treasury and the District Court’s inferences and findings, the powers that these men did or did not have as President of the United States, in Congress Assembled are not the issue of this Writ of Mandamus but for sake of avoiding yet a third dismissal the powers have been addressed. What is at issue here is whether or not these Constitution of 1777 Presidents were Presidents of the United States. To illustrate the merit of the position that they were indeed Presidents of the United States let’s examine the Colonial history of the United States and Great Britain. King James I Jamestown Charter began the ultimate establishment of the 13 original states as colonies on May 14, 1607. Four years prior to that date, QueenElizabeth I ruled as one of the most powerful monarchs in the history of western civilization. Elizabeth I has since been followed, 349 years later, by Queen Elizabeth II, who has limited authority when compared to boundless power of her predecessor, under what is seemingly an eternal revision of Great Britain’s de facto constitution. The duties and powers of the Crown – Queen in this case, have dramatically changed since Colonial America. These constitutional changes, however, do not connote thatElizabeth II is no longer a Queen of England. Conversely, the ten men who served as Presidents of the United States, in Congress Assembled under the Constitution of 1777 had duties quite different then the Constitution of 1787 Presidents. Additionally, George Washington, the First Commander-in-Chief of the United States during the Revolutionary War reported toConstitution of 1777 Presidents of the United States who all had duties quite different then George Bush who currently serves as Commander-in-Chief over The United States’ War on Terror. Is not George Bush Commander-in-Chief in a line that began in 1775 or do we to preclude that office under the Constitution of 1777 and limit the Commander-in-Chief line to 1789 - 2008? Of course not since the Commander-in-Chief line began with George Washington in the Revolutionary War which concluded with the Treaty of Paris in 1783. 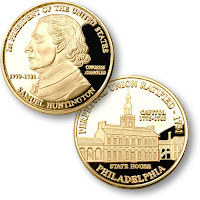 Likewise, is not Samuel Huntington a President of the United States or must we accept the District Court’s interpretation of the Coin Act that the clause “beginning with President George Washington” starts the presidential line in 1789 duping the citizens of the United States that no Presidents of the United States served before George Washington. This author, despite this horrendous historical inaccuracy on the very founding of the U.S. Presidency, would stand down had Congress not enacted such a misleading law. 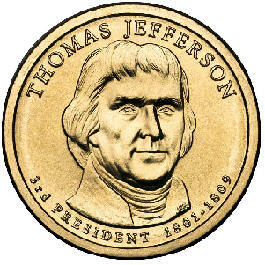 The bill Congress enacted states over and over again that all deceased U.S. Presidents are to be issued a $1.00 coin. If the Constitution of 1777 Presidents are deemed Presidents of the United States by this Court, and this Appellant has no doubt in that outcome should the dismissal be overturned, then Samuel Huntington, Thomas McKean, John Hanson, Elias Boudinot, Thomas Mifflin, Richard Henry Lee, John Hancock, Nathaniel Gorham, Arthur St. Clair and Cyrus Griffin as well as their spouses can be so ordered by the Court to take the rightful places on the $1.00 coins of the United States of America. If we follow the District Court’s July 14th, 2008 case law, dismissing this case on one isolated clause “beginning with President George Washington” then it stands to reason Martha Washington should not be included on the coinage. It is true she is a spouse of President. It is also true First Lady Washington spearheaded and highlighted important issues for the country including traveling with the Commander-in-Chief during the Revolutionary War organizing women’s groups to feed, mend and make clothing for the United States troops. It is, however, incorrect that she set “… the social tone for the White House” as Abigail Adams was the first First Lady to occupy that historic structure. There are more words in this clause then the later so should the District Court’s ruling be upheld this ambiguous language, plausibly, can be isolated and utilized in the case elimination Martha Washington’s coin. More importantly, does the public know which First Lady truly “set the social tone for the White House? as well as honoring important guests at federal presidential functions? It was actually the spouse of the 10th President of the United States under the Constitution of 1777 who set the social tone for the founding First Ladies. John Stuart, the Earl of Traquair had three daughters, the Lady Christina, the Lady Mary and the Lady Louisa. The Lady Christina was strikingly beautiful and her personality so magnetic that the handsome young Virginian, Cyrus Griffin couldn't resist making a bold, but private, declaration to win the Lady's heart while visiting his friend in Scotland. When the Earl learned of Cyrus' intentions, he immediately admonished his son Lord Linton for allowing this Virginia plebian to enter Traquair's noble gates. The Earl reportedly raved and ranted at the rest of his family, for not uncovering this mischief sooner as such a scandal threatened the social standing of his noble house. Cyrus was escorted off the estate becoming persona non grata in the House of Traquair. The Earl forbade Christina from ever seeing Cyrus again and implemented estate security measures to end the love affair. The courtship did not end, and it became real runaway months later through the forests, over hill and dale in a wild flight from Traquair on a spring day in 1770. In the escape, the Lady Christina fell and broke her ankle. Family legend has it that Cyrus, undetermined not to let the event spoil their passionate plans, scooped her up and carried his lover through the countryside not to a doctor but to a parson. The minister, despite their disheveled appearance and her swollen ankle, united them in the bonds of matrimony on April 29, 1770. That a chair he placed in the Senate-Chamber for the President of the United Stares. That a chair be placed in the Senate-Chamber for the Vice-President, to the right of the President’s chair; and that the Senators take their seats on that side of the chamber on which the Vice-President’s chair shall be placed. That a chair be placed in the Senate-Chamber for the Speaker of the House of Representatives, to the left of the President’s chair—and that the Representatives take their seats on that side of the chamber on which the Speaker’s chair shall be placed. Is not this story pivotal to fulfilling Congress’ intent in constructing the Coin Act as far as First Ladies are concerned? If this is intent of the bill why does the Secretary argue founding Constitution of 1777 U.S. Presidents are excluded from the Act with so much as a hearing? It should be noted that if it were not for Supreme Court Justice Oliver Ellsworth the language in the 2005 Presidential Coin Act would not ambiguous or be in need of judicial interpretation. It was Governor Edmund Randolph of Virginia who moved to re-name the United States, the “National Government”, in the Constitution of 1787’s Philadelphia Convention. From that point on the term United States replaced National Government. The words, "of America”, were added by Delegate Gouverneur Morris in the final editorial changes of the Constitution of 1787. Had the Philadelphia Convention titled the nation, “The National Government of America” then George Washington would have been “stiled,” rightfully, the first President of the National Government of America. This was not the case, and George Washington shares that title President of the United States with Constitution of 1777 Presidents. The District Court wrongfully sought resolution of the pivotal issue in this case, by skirting the interpretation of the term “president” within the meaning of the Presidential Coin Act, by ordering the case closed on July 14, 2008. “The fact that a duty becomes clear only after construction of a statute” does not mean that Appellant has not stated a claim for mandamus relief. White v. Matthews, 420 F. Supp. 882, 888 (D.S.D. 1976). See also Carey v. Local Board No. 2, 297 F. Supp. 252, 254 (D. Conn. 1969) (“The fact that a statute may require administrative or judicial construction in order to determine what duties it creates does not mean that mandamus is not proper to compel the officer to perform that duty once it is determined”); and Martinez v. Dunlop, 411 F. Supp. 5, 9 (N.D. Cal. 1976). To reiterate, the use of the words “in Congress Assembled” in the Coin Act which, are also found in the April Fool’s Day Treasury letter exemplifies the confusion surrounding the United States Presidency in the executive and legislative branches of government. The record reports two state-ratified federal constitutions of the United States of America. 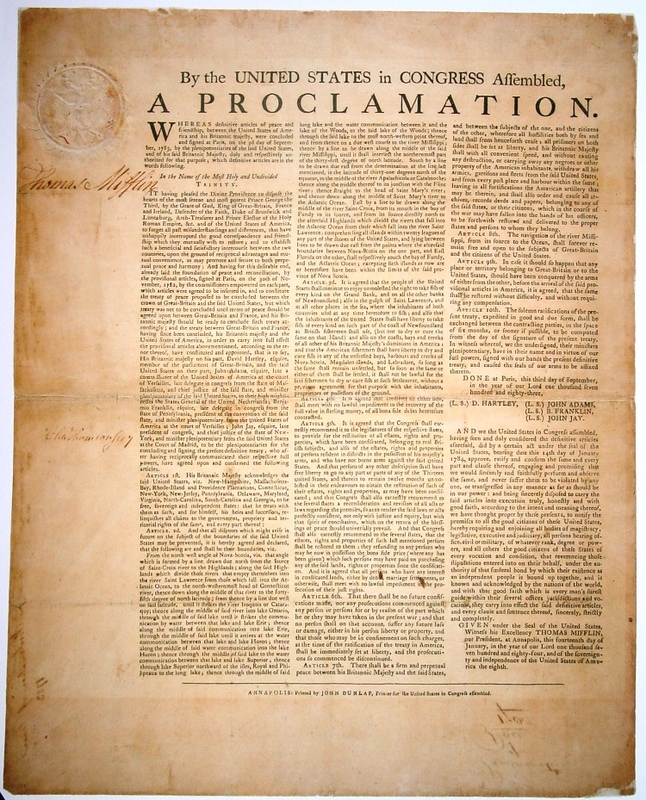 The first, the Constitution of 1777, referred to as the “Articles of Confederation and Perpetual Union,” and the second, is the current Constitution of 1787 referred to as “this Constitution for the United States of America.” There was also a third form of central government known as the Continental Congress that operated under the 1774 Articles of Association. 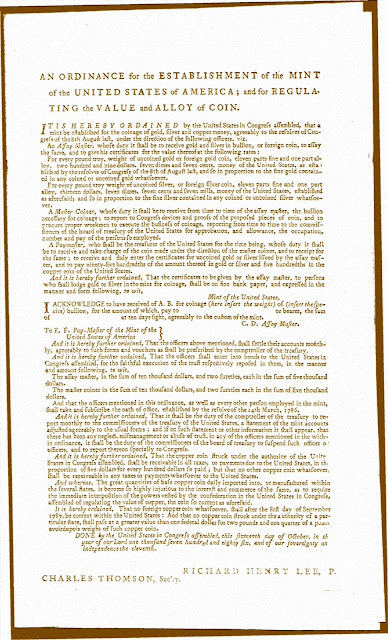 This listing adopts the verbiage 1774 Articles of Association while disregarding the language of the Constitution of 1777, “Articles of Confederation and Perpetual Union.” As discussed above, there was a “Continental Congress” of the United Colonies and later the United States formed in 1774. The “Continental Congress,”however, was dissolved after the March 1, 1781 ratification of the Constitution of 1777 replacing it with the United States, in Congress Assembled. The Appellant respectfully requests the Court to interpret the meaning of the term “president” in the Presidential Coin Act and then determine where mandamus will lie. This issue, legally and for the sake of these great founding men and women, cannot be determined in the context of a motion to dismiss. The Court does have the authority to weigh the evidence and find that the omission of the Constitution of 1777 Presidents $1 Coins is in direct violation of the language incorporated in the 2005 Coin Act Bill. The Court has the authority to order the Secretary of the Treasury to issue $1.00 coins for the Constitution of 1777 Presidents and their spouses. Additionally, the ambiguity in the both Coin Acts’ language is due, in part, to the complexity of the founding period. If the Biographical Directory of the United States Congress editors are floundering in their reporting of this period, who then can set the record right if not the judiciary branch of government? At the very least, a proper hearing and ruling in this case, will result in future bills regarding U.S. Presidential History being properly drafted with precise language eliminating those who served as Presidents of the United States under the Articles of Confederation by the United States House and Senate in Congress Assembled if that was indeed their intention. Several Gentleman of the Republican Party have wished to use my name as a Candidate for Vice President, but I have absolutely declined it on public and personal considerations, and my reasons seem to have given satisfaction. Former President McKean, although respectful of President Jefferson’s office, saw the Vice Presidency as a post vastly substandard to the office of President of the United States he held in the crucial months of 1781. Accordingly, the Defendant’s respectfully requests that the honorable court reverse the motion to dismiss and order a hearing to interpret the meaning of the term“president” in the Presidential Coin Act. 1. Civil Docket for Case No. 8:08-cv-00843-SDM- TBM, U.S. District Court for the Middle District of Florida, Klos v. Paulson, case filed 5/01/2008. 9. Notice of Appeal by Stanley L. Klos, 08/12/2008. 10. Appearance of Counsel Form, Michelle Thresher Taylor. THE UNDERSIGNED UNDERSTANDS A MATERIAL MISREPRESENTATION IN COMPLETING THIS CERTIFICATE, OR CIRCUMVENTION OF THE TYPE-VOLUME LIMITS IN FED. R. APP. P. 32(a) (7), MAY RESULT IN THE COURT'S STRIKING THE BRIEF AND IMPOSING SANCTIONS AGAINST THE PERSON SIGNING THE BRIEF. 50 States Commemorative Coin Program Act (Enrolled Bill), --S.1228-- An Act To provide for a 10-year circulating commemorative coin program to commemorate each of the 50 States, and for other purposes. Be it enacted by the Senate and House of Representatives of the United States of America in Congress assembled. Department Treasury Letter to Stanley L. Klos, May 13, 2002. Constitution of the United States, Article II, Section 2. Journals of the United States in Congress Assembled, September 28, 2787, United States Constitution of 1787 Article II, Section 2 (2)The President shall be Commander-in-Chief of the Army and Navy of the United States, and of the militia of the several States, when called into the actual service of the United States. Smith, Paul H., et al., eds. 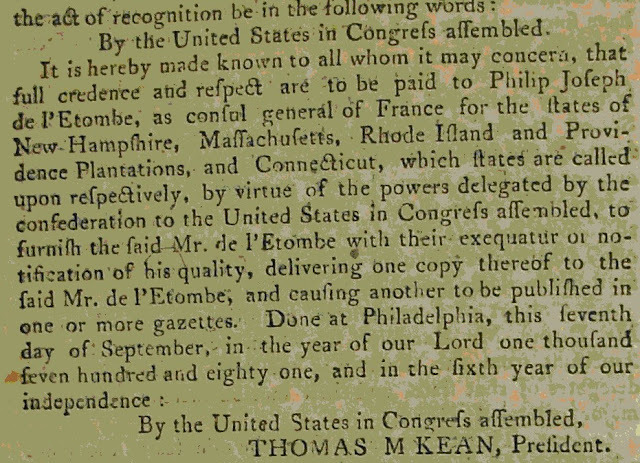 Letters of Delegates to Congress, 1774-1789. 25 volumes, “President Samuel Huntington to Governor Jonathan Trumbull – April 30, 1781 President Hunting ton writes: “I hope, before this, some delegates from Connecticut are on the way to Congress, I am once more left alone from the state and shall not be able to attend any consid­erable time longer myself.” , Washington, D.C.: Library of Congress, 1976-2000). The Cout de Moustier to John Jay, February 19, 1788, Diplomatic Correspondence of the U.S., 348-349. 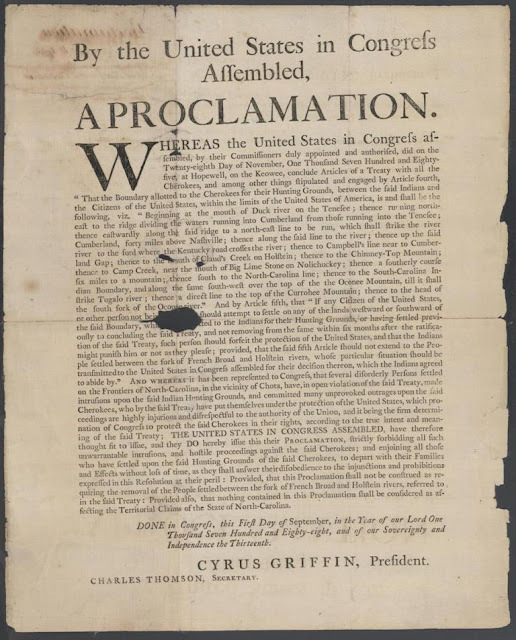 Ibid, “South Carolina appeal for congressional intervention in hearing boundary dispute with Georgia” September 11, 1786. Journals of the United States in Congress Assembled, “approves acquittal of leaders of the Philadelphia mutiny” September 13, 1783. 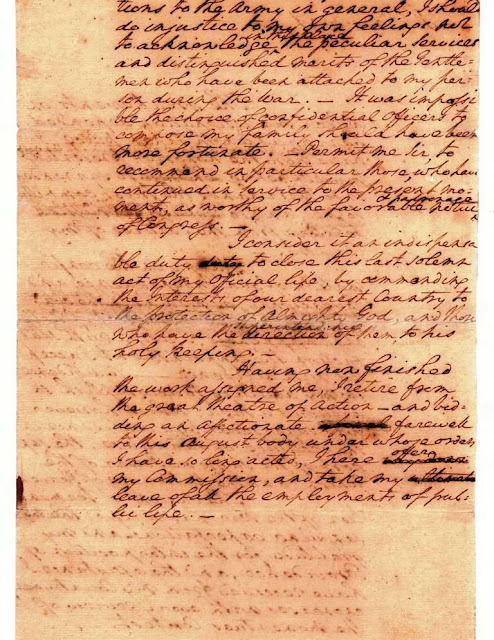 Journals of the United States in Congress Assembled, “Connecticut-Pennsylvania boundary dispute” June 27, 1782 and January 3, 1783 - first settlement of interstate dispute under Constitution of 1777. The History of the Monarchy, ELIZABETH I, http://www.royal.gov.uk/output/Page46.asp, The British Royal Household. Washington, George to President Thomas McKean, October 6, 1781 – Camp before York, Sir: … I am not apt to be sanguine, but I think in all human probability Lord Cornwallis must fall into our hands. … The variety of matter which engages my attention must be my apology. My public dispatch will inform your Excellency of our progress up to this date. With the greatest esteem and respect etc., George Washington Papers, Library of Congress. The Constitution of the United States of America, Preamble, Original Manuscript, September 17, 1787, National Archives, Washington, DC. 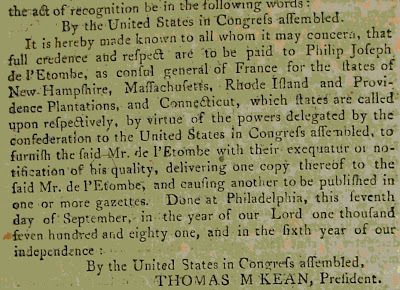 Journal of the Continental Congress, Articles of Association, October 20, 1774. HENRY M. PAULSON, JR., Secretary of the Treasury, Defendant. 1. Plaintiff is an individual who resides in Pinellas County, Florida. At all times material hereto, Plaintiff is and has been the father of three minor children who reside in Pinellas County, Florida. was an agent or employee of the Treasury Department. 3. The Court has subject matter jurisdiction over this action pursuant to 28 U_S.C. Sections 1361, 1331, and 2201. 4. Venue is proper in this District pursuant to 28 U.S.c. Section 1391(e). 6. Title I of the Presidential Coin Act amends 31 U.S.c. 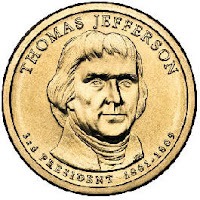 Section 5112 to add a new subsection (n), and directs the Secretary of the Treasury to issue one dollar coins that bear designs that” are emblematic of the Presidents of the United States.” Presidential Coin Act, Sec. 1 02; 31 U.S.C. Section 5112©. The Presidential Coin Act further directs the Secretary of the Treasury to mint coins until each President has been honored. 9. The Constitution of 1777 Presidents are “Presidents of the United States” within the meaning of the Presidential Coin Act. 10. The Department of Treasury, in direct violation of its duty under the Presidential Coin Act continues to wrongfully refuse to issue coins hearing the images of the Constitution of 1777 Presidents. 11. Plaintiff has been injured by the Defendant’s wrongful refusal to issue coins bearing the images of the Constitution of 1777 Presidents and will continue to suffer injury in the future in that Defendant’s conduct perpetuates the commonly held misconception that the Constitution of 1777 Presidents were not “Presidents of the United States” and misleads all students in America, including Plaintiffs minor children, concerning the existence and identity of the earliest founders and Presidents of the United States. Additionally, the Plaintiff is an exhibitor of rare historical U.S. Presidential manuscripts and this commonly held misconception creates an constant and consistent impediment for inclusion of the Constitution of 1777 Presidents in Presidential Exhibits. 12. This is an action for declaratory relief pursuant to 28 U.S.C. Section 2201. 13. Plaintiff incorporates and realleges the allegations of paragraphs 1 through 11 above. 14. 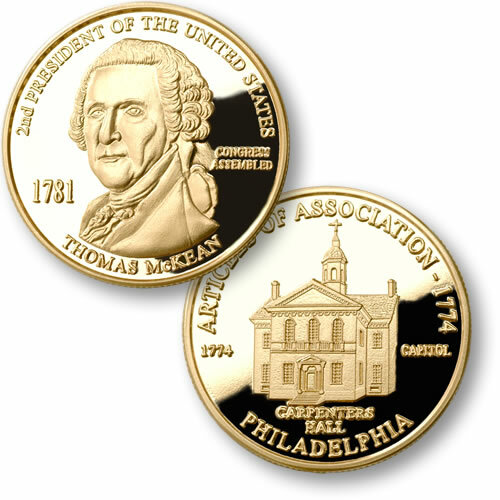 An actual controversy exists between Plaintiff and Defendant concerning whether the Constitution of 1777 are “Presidents of the United States” within the meaning of the Presidential Coin Act, such that Defendant is required by law to issue coins bearing the images of the Constitution of 1777.
granting such other, further or different relief as is just and equitable. 15. This is an action pursuant to 28 U.S.C. Section 1361. 16. Plaintiff incorporates and realleges the allegations of paragraphs I through 11 above. WHEREFORE. Plaintiff demands judgment against Defendant: (a) compelling Defendant to issue one dollar coins bearing the images of each of the Constitution of 1777 Presidents; and (b) granting such other, further or different relief as is just and equitable. The 4th President of the United States was actually Elias Boudinot and not James Madison. 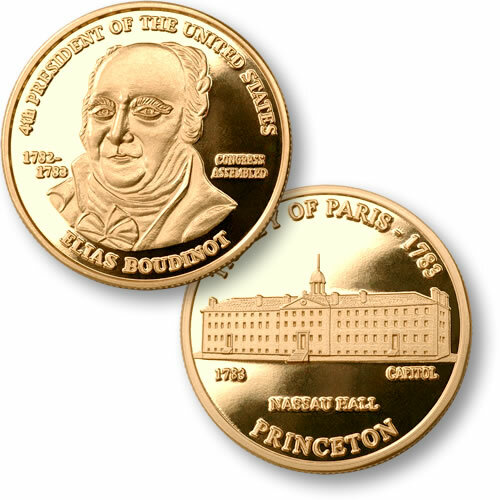 Elias Boudinot would later serve as George Washington, James Adams and Thomas Jefferson's Director of the U.S. Mint. It is most disheartening to this author that The U.S. Mint is wrongfully ordered by Congress and the President to perpetuate the myth that George Washington was the 1st President of the United States. In his Complaint, filed on May 1, 2008, Plaintiff alleges that the Department of the Treasury "wrongfully refuses to issue coins bearing the images of the Constitution of 1777 Presidents." Compl. at §10. The “Constitution of 1777 Presidents" are individuals who served as President under the Articles of Confederation. Compl. at § 7. Plaintiff seeks declaratory judgment against the Defendant, demanding a declaration that (1) the "Constitution of 1777 Presidents" are Presidents of the United States within the meaning of the Act, and (2) the Act requires Defendant to issue $1 coins bearing the images of each of the "Constitution of 1777 Presidents." In addition, Plaintiff seeks judgment against the Defendant compelling him to issue $1 coins bearing the images of each of the "Constitution of 1777 Presidents." At issue is the Presidential $1 Coin Act of 2005 (hereafter "the Act"), which was enacted by Congress on December 22, 2005. By amending 31 U.S.C. § 5112, the Act requires, inter alia, the Secretary of the Treasury to issue $1 coins in commemoration of each of the Nation's past Presidents in the order in which each President served. 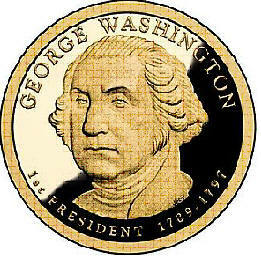 The statute makes clear that the coins are to be issued in the order in which past presidents served, starting with President George Washington. A. THE COURT SHOULD DISMISS PLAINTIFF'S COMPLAINT FOR FAILURE TO STATE A CLAIM UPON WHICH RELIEF CAN BE GRANTED. Federal Rule of Civil Procedure 12(b)(6) provides for dismissal for "failure to state a claim upon which relief can be granted." Dismissal under Rule 12(b)(6) is appropriate when it clearly appears that the plaintiff can prove no set of facts in support of the claim which would entitle him to relief. Conley v. Gibson, 355 U.S. 41, 45-46 (1957). In deciding a motion to dismiss pursuant to Rule 12(b)(6), all facts alleged in the complaint must be accepted as true. Spain v. Brown & Williamson Tobacco Corp., 363 F.3d 1183, 1187 (11th Cir. 2004). However, a court may not accept conclusory allegations and unwarranted factual deductions as true. Lockheed Marlin Corp. v. Boeing Co., 314 F.Supp. 2d 1198, 1207 (M.D.Fla. 2004). 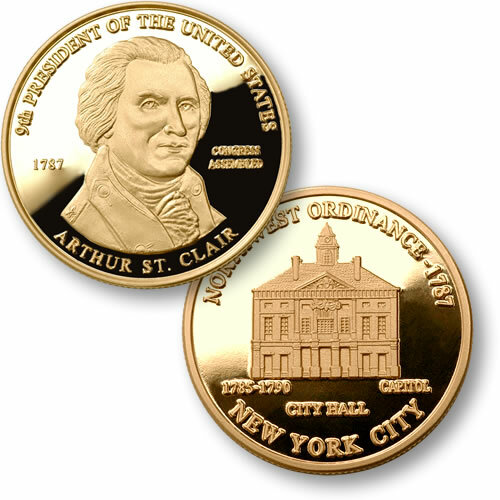 (A) ORDER OF ISSUANCE - The coins issued under this subsection commemorating Presidents of the United States shall be issued in the order of the period of service of each President, beginning with President George Washington. (emphasis added). The "Constitution of 1777 Presidents" preceded President George Washington's service as President of the United States. Congress has explicitly articulated to the Secretary of the Treasury that the Presidential $1 Coins shall be issued in the order of the period of service beginning with President George Washington. Since Congress does not grant the Secretary of the Treasury any authority to include the "Constitution of 1777 Presidents" in the coin program, neither the Secretary nor the Department has "wrongfully refused" to issue such coins. 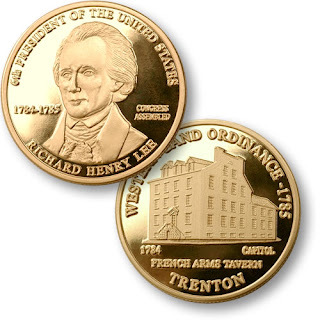 Thus, Plaintiffs demand for a declaratory judgment indicating that the Act requires the Secretary to issue such coins is clearly unsupported. In addition, a declaration that the "Constitution of 1777 Presidents" are Presidents of the United States within the meaning of the Act is improper as the Act does not provide for the inclusion of such individuals in the coin program. Likewise, the Secretary does not owe a duty to issue coins bearing the images of each of the "Constitution of 1777 Presidents" since the Act does not grant the Defendant such authority. Thus, the Secretary of the Treasury cannot be compelled by a writ of mandamus to perform a duty that has not been imposed by law. United States ex reI. Redfield v. Windom, 137 U.S. 636, 643-44 (1890). In fact, it would be contrary to the statute, as enacted, to issue coins bearing images of anyone serving in the office of "Constitution of 1777 President" because those individuals' service predates that of President George Washington. The historical contentions set forth by the Plaintiff in his Complaint as to whether the "Constitution of 1777 Presidents" served in the same capacity as President George Washington and his successors are immaterial in this matter. These arguments are legally insufficient to support the relief sought since, as previously stated, the Act does not grant the Defendant any authority to issue coins bearing the images of each of the "Constitution of 1777 Presidents." For the reasons set forth above, the Count should dismiss Plaintiffs complaint for failure to state a claim upon which relief can be granted. Enclosed please find my response to the 6/16/08 DEFENDANT'S MOTION TO DISMISS. "But the Day is past. The Second Day of July 1776, will be the most memorable Epocha, in the History of America. I am apt to believe that it will be celebrated, by succeeding Generations, as the great anniversary Festival. It ought to be commemorated, as the Day of Deliverance by solemn Acts of Devotion to God Almighty. It ought to be solemnized with Pomp and Parade, with Shews, Games, Sports, Guns, Bells, Bonfires and Illuminations from one End of this Continent to the other from this Time forward forever more." 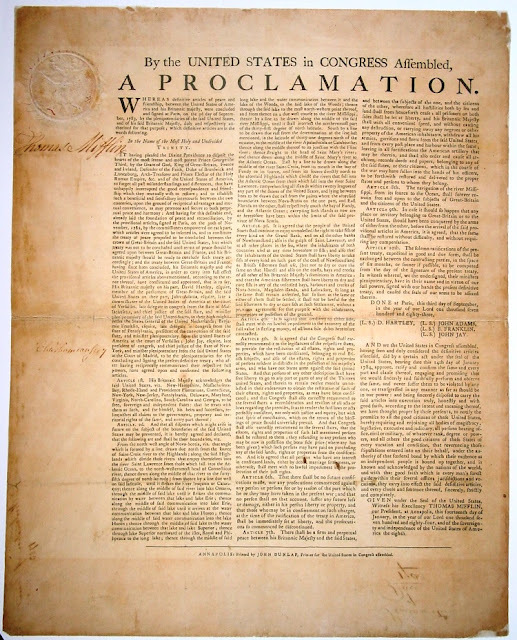 We of course celebrate the 4th of July as “Independence Day” as that is when the 12 Colonies passed the Long Resolution for Independence -- New York held off until July 9th. This case involves claims for declaratory and mandamus relief against the Secretary of the Treasury, pursuant to 28 U.S.C. Sections 2201 and 1361. Specifically, Plaintiff seeks the entry of an order compelling the Secretary of the Treasury to comply with the requirements of the Presidential $1 Coin Act of 2005 (the “Presidential Coin Act”), 31 U.S.C. Section 5112, by minting coins bearing the images of Presidents Samuel Huntington, Thomas McKean, John Hanson, Elias Boudinot, Thomas Mifflin, Richard Henry Lee, John Hancock, Nathaniel Gorham, Arthur St. Clair and Cyrus Griffin (collectively, the “Constitution of 1777 Presidents”). Complaint, ¶10. Defendant’s Motion to Dismiss asserts that the Complaint should be dismissed for failure to state a claim upon which relief can be granted. Specifically, Defendant asserts that declaratory and mandamus relief is not warranted because the statute does not support the claims asserted by Plaintiff. Specifically, Defendant contends that the term “president” as used in the Presidential Coin Act does not include the Constitution of 1777 Presidents. Defendant seeks to have the Court decide the merits of the case in the context of a motion to dismiss. However, “a well-pleaded complaint will survive a motion to dismiss” “even if it strikes a savvy judge that actual proof of those facts is improbable, and ‘that a recovery is very remote and unlikely.’ ” Bell Atlantic Corp. v. Twombly, ---U.S. ----, ---- - ----, 127 S.Ct. 1955, 1965, 167 L.Ed.2d 929 (2007) (internal citations omitted). Defendant is seeking resolution of the pivotal issue in this case, interpretation of the term “president” within the meaning of the Presidential Coin Act, by a motion to dismiss. “The fact that a duty becomes clear only after construction of a statute” does not mean that Plaintiff has not stated a claim for mandamus relief. White v. Matthews, 420 F. Supp. 882, 888 (D.S.D. 1976). See also Carey v. Local Board No. 2, 297 F. Supp. 252, 254 (D. Conn. 1969) (“The fact that a statute may require administrative or judicial construction in order to determine what duties it creates does not mean that mandamus is not proper to compel the officer to perform that duty once it is determined”); and Martinez v. Dunlop, 411 F. Supp. 5, 9 (N.D. Cal. 1976). In this case, the Court must interpret the meaning of the term “president” in the Presidential Coin Act before it can determine whether mandamus will lie. This issue can not be determined in the context of a motion to dismiss. Accordingly, the Defendant’s Motion to Dismiss should be denied. In 1774 the First Congressional Caucus of The United Colonies occurred in a Tavern where it was decided Peyton Randolph serves as President the Delegates would formally assemble in Carpenters Hall. 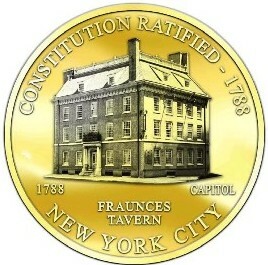 In 1789 while New York City Hall was being renovated the new-tri-cameral government, President Griffin and the delegates convened the United States in Congress Assembled for the last time at Fraunces Tavern in New York City. The plaintiff sues Henry M. Paulson, the Secretary of the Treasury, and alleges that the Secretary fails to comply with Section 102 of the “Presidential $1 Coin Act of 2005" (the “Coin Act”).1 Section 102 amends 31 U.S.C. 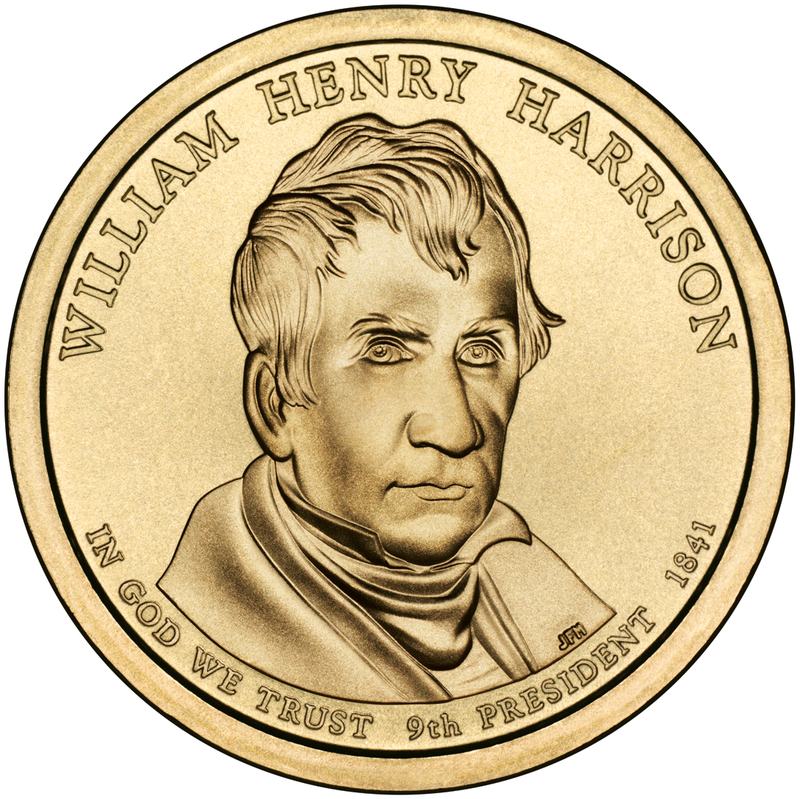 § 5112 by adding subsection 5112(n), entitled “Redesign and Issuance of Circulating $1 Coins Honoring Each of the Presidents of the United States,” which directs the Secretary to issue one dollar coins bearing designs that “are emblematic of the Presidents of the United States,” 31 U.S.C. § 5112(n)(1)(A), and directs that the issuance of coins shall continue until “each President has been so honored,” 31 U.S.C. § 5112(n)(8). 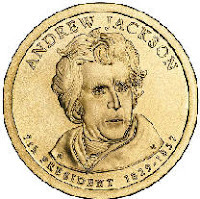 The plaintiff alleges that the Secretary violates the Coin Act by refusing to issue a coin bearing the image of each “president” who served under the Articles of Confederation, denominated by the plaintiff as the “Constitution of 1777.” The plaintiff seeks (a) a declaration pursuant to 28 U.S.C. § 2201 that each “Constitution of 1777 President” is a President of the United States within the meaning of the Coin Act and that the Coin Act requires the Secretary to issue a one dollar coin bearing the image of each “Constitution of 1777 President,” and (b) an order pursuant to 28 U.S.C. § 1361 compelling the Secretary to issue the statutorily required one dollar coins. The plaintiff misconstrues Rule 12(b)(6). On a motion to dismiss for failure to state a claim, “a judge must accept as true all of the factual allegations contained in the complaint,” Erickson v. Pardus, 127 S. Ct. 2197, 2200 (2007), and must construe the factual allegations most favorably to the plaintiff, Hill v. White, 321 F.3d 1334, 1335 (11th Cir. 2003). However, “legal conclusions masquerading as facts will not prevent dismissal.” Oxford Asset Mgmt., Ltd. v. Jaharis, 297 F.3d 1182, 1188 (11th Cir. 2002). The defendant disputes no fact alleged in the complaint. 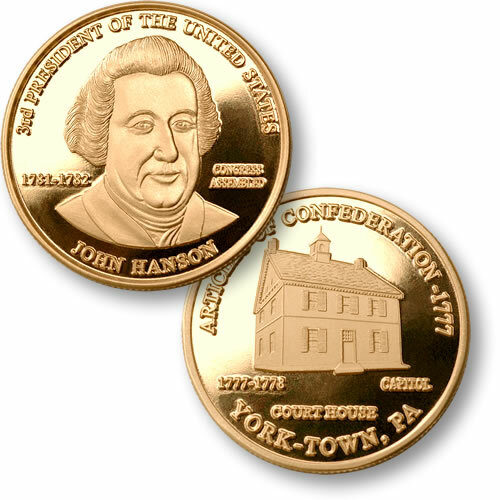 Instead, the defendant contests a legal conclusion – that the Coin Act requires the Secretary to issue a one dollar coin bearing the image of each “Constitution of 1777 President” – essential to the plaintiff’s right to relief. The Coin Act’s requirement that the coins be issued “in the order of the period of service of each President, beginning with President George Washington” strongly supports the defendant’s contention, and the plaintiff offers no convincing argument, explanation, or citation of authority 3 to support a contrary interpretation of the statute.4 Because the Coin Act neither requires nor authorizes the Secretary to issue a coin bearing the image of each “Constitution of 1777 President,” the complaint asserts no cognizable right to relief under 28 U.S.C. § 1361 and declaratory relief under 28 U.S.C.§ 2201 is inappropriate. The plaintiff’s wish to correct what he regards as a widespread misconception about those who served the nation under the Articles of Confederation is laudable.However, the plaintiff’s remedy, if any, lies in the legislature. The defendant’s motion (Doc. 11) is GRANTED. Because amendment would be futile, the complaint is DISMISSED WITH PREJUDICE for failure to state a claim on which relief can be granted. The Clerk is directed to terminate any pending motion and close the case. ORDERED in Tampa, Florida, on July 14, 2008. 1 Pub. L. No. 109-145, 119 Stat. 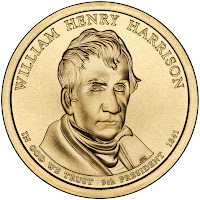 2664 (“An Act to Require the Secretary of the Treasury to Mint Coins in Commemoration of Each of the Nation’s Past Presidents and Their Spouses, Respectively, to Improve Circulation of the $1 Coin, to Create a New Bullion Coin, and for Other Purposes.”). 2 Although the plaintiff’s claim of standing to sue (Doc. 1 ¶ 11) appears actually doubtful, “[a]t the pleading stage, general factual allegations of injury resulting from the defendant's conduct may suffice, for on a motion to dismiss we ‘presum[e] that general allegations embrace those specific facts that are necessary to support the claim,’” Lujan v. Defenders of Wildlife, 504 U.S. 555, 561 (1992). 3 The plaintiff’s March 20, 2008, letter to Secretary Paulson (Doc. 1-3 at 4) informs the Secretary that the Coin Act, properly implemented, “can do more than Congress and President Bush ever envisioned” to honor the pre-1789 presidents. Plaintiff, Stanley Klos, files this memorandum of law and respectfully requests that the Court reconsider its Order dated July 14, 2008 dismissing the Plaintiff’s complaint against Treasury Secretary Henry Paulson for the reason that the Court did not have certain facts and arguments before it for consideration at the time of ruling on the Defendant’s Motion to Dismiss. This case involves claims for declaratory and mandamus relief against the Secretary of the Treasury, pursuant to 28 U.S.C. Sections 2201 and 1361. Specifically, Plaintiff seeks the entry of an order compelling the Secretary of the Treasury to comply with the requirements of the Presidential $1 Coin Act of 2005 (the “Presidential Coin Act”), 31 U.S.C. Section 5112, by minting coins bearing the images of Presidents Samuel Huntington, Thomas McKean, John Hanson, Elias Boudinot, Thomas Mifflin, Richard Henry Lee, John Hancock, Nathaniel Gorham, Arthur St. Clair and Cyrus Griffin (collectively, the“Constitution of 1777 Presidents”). Complaint, ¶10. The plaintiff misconstrues Rule 12(b) (6). On a motion to dismiss for failure to state a claim, “a judge must accept as true all of the factual allegations contained in the complaint,” Erickson v. Pardus, 127 S. Ct. 2197, 2200 (2007), and must construe the factual allegations most favorably to the plaintiff, Hill v. White, 321 F.3d 1334, 1335 (11th Cir. 2003). However, “legal conclusions masquerading as facts will not prevent dismissal.” Oxford Asset Mgmt., Ltd. v. Jaharis, 297 F.3d 1182, 1188 (11th Cir. 2002). The Plaintiff respectfully submits to the Court that the July 14th, 2008 Order exemplifies why “a well-pleaded complaint MUST survive a motion to dismiss” “even if it strikes a savvy judge that actual proof of those facts is improbable, and ‘that a recovery is very remote and unlikely.’ ” Bell Atlantic Corp. v. Twombly, ---U.S. ----, ---- - ----, 127 S.Ct. 1955, 1965, 167 L.Ed.2d 929 (2007) (internal citations omitted) and this case’s dismissal be reconsidered. In his response, the Plaintiff reasoned the facts were so clear in the Constitution of 1777 Presidents case that burdening the court with pre-mature argument was not necessary when considering the Bell Atlantic Corp. v. Twombly precedent. Therefore, with the Court concluding otherwise this Pro Se Plaintiff respectfully requests the Court consider these new facts in a full refutation to the Secretary’s motion to dismiss and the Court’s July 14th order. Defendant’s Argument #1: “The coins issued under this subsection commemorating Presidents of the United States shall be issued in the order of the period of service of each President, beginning with President George Washington”. There is no question that the first $1.00 coin must and historically should start with President George Washington. George Washington was not only the first President under the 1787 Constitution of the United States but he was also the only Commander-in-Chief of the United Colonies of America under the 1774 Articles of Association as well as the First Commander-in-Chief under the Constitution of 1777. (See Exhibit A) . The Constitution of 1787 combined both of the offices of Commander-in-Chief and U.S. President. The Constitution of 1777, however, recognized the separation of the two offices until December 23, 1783 when Commander-in-Chief Washington resigned his office to President of the United States Thomas Mifflin (Exhibit B), a former Revolutionary War Major General. 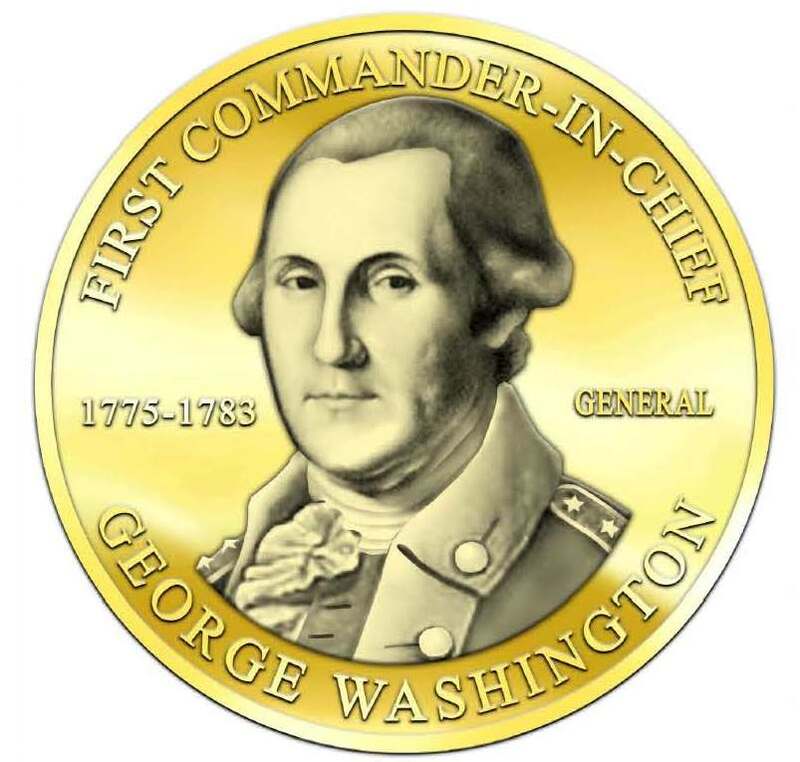 It is the Plaintiff’s contention that after the minting George Washington’s Commander-in-Chief Presidential Coin (Service from 1775-1783 – see Exhibit C) the Secretary should have moved on to President Samuel Huntington until the minting of the 12th coin which would be for George Washington (Service from 1789 to 1797) as President and Commander-in-Chief under the Constitution of 1787. The language “beginning with President George Washington” in this Act, therefore, no way precludes the Secretary of the Treasury from issuing coins for Constitution of 1777 Presidents. In fact with the phrase “beginning with President George Washington” now understood in its proper historical context, the remaining language in the Act requires the Secretary of the Treasury to mint dollar coins for all Constitution of 1777 Presidents. On the contrary, should the Court find the Constitution of 1777 Presidents are rightfully Presidents of the United States the coins must be issued. The Act Section 5112 of title 31, United States Code, (n) states that the “Redesign and Issuance of Circulating $1 Coins Honoring Each of the Presidents of the United States” is clear and does not, in any way, omit the Constitution Presidents of 1777. 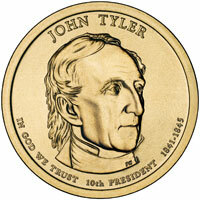 Additionally the Act continues with more language requiring each President be so honored with a $1.00 Coin. Section 4 (A) of the Act states, “In general. --The designs for the $1 coins issued during each year of the period referred to in paragraph (1) shall be emblematic of 4 Presidents until each President has been so honored.” The Bill also States in 3(A) “Coin obverse. 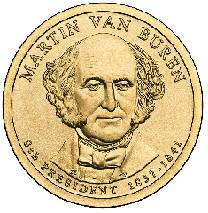 --The design on the obverse shall contain--``(i) the name and likeness of a President of the United States; and ``(ii) basic information about the President, including--``(I) the dates or years of the term of office of such President; and ``(II) a number indicating the order of the period of service in which the President served.” More importantly, no where in the Bill does the law preclude the honoring of the Constitution of 1777 Presidents. The Secretary’s argument that “The historical contentions set forth by the Plaintiff in his Complaint as to whether the Constitution of 1777 Presidents served in the same capacity as President George Washington and his successors are immaterial in this matter” is not only fallacious but the very core of this case. If these men were Presidents of the United States then, by the language of this bill, they should be so honored along with their spouses Martha Devotion Huntington, Mary Borden Sarah Armitage McKean, Jane Contee Hanson, Annis Stockton Boudinot, Sarah Morris Mifflin, Elizabeth Eskridge Lee, Dolly Quincey Hancock, Rebecca Call Gorham, Phoebe Bayard St. Clair, and Lady Christine Stewart Griffin as the title of the Act itself States: “An Act To require the Secretary of the Treasury to mint coins in commemoration of each of the Nation's past Presidents and their spouses, respectively, to improve circulation of the $1 coin, to create a new bullion coin.” This is further supported by Section 8 of the Coin Act Bill stating – “Termination of program. -- The issuance of coins under this subsection shall terminate when each President has been so honored, subject to paragraph (2) (E), and may not be resumed except by an Act of Congress.” If the Court finds these men were not Presidents of the United then the Secretary is released from his burden to honor these great patriots in the $1 Coin Program. 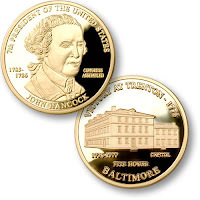 Defendant’s Argument #3: “The Act does not grant the Defendant any authority to issue coins bearing the images of each of the "Constitution of 1777 Presidents." The act, as stated above in Argument #2, not only provides the authority to the Secretary of the Treasury to mint such coins but Congress deemed the power so paramount to the bill that it they placed the authority the Act’s official description “An Act To require the Secretary of the Treasury to mint coins in commemoration of each of the Nation's past Presidents and their spouses, respectively, to improve circulation of the $1 coin, to create a new bullion coin.” If the Court finds these men were Presidents of the United then the Secretary must mint the Presidential $1 coins. No where in the Coin Act does the Congress ever address the title or duties of Chief Executive to be a pre-requisite of minting the $1 coins. No where in the Coin Act does Congress provide any criteria to exclude the Constitution of 1777 Presidents. Moreover, these Presidents utilized their office to exercise much influence on United States public affairs and legislation. It will be argued in this case that in many instances the Constitution of 1777 Presidents actually had more “Head of State” powers then George W. Bush, the current President of the United States. · The Presidents issued military orders (Exhibit D, President John Hanson - September 7, 1782 Military directive to George Washington), signed military commissions, (Exhibit E, President Samuel Huntington -- Signed Military Commission), Diplomatic Commissions (Exhibit F, President Thomas McKean, September 7, 1781 Commission of Joseph de l” Etombe), treaties (Exhibit G, Thomas Mifflin – ratifying the 1783 Treaty of Paris), proclamations (Exhibit H, Cyrus Griffin – September 5, 1788, Cherokee Proclamation), and resolutions (as Exhibit I, Richard Henry Lee - October 16, 1786 Ordinance Establishing the U.S. Mint) Presidents of the United States. · The Presidents acted similar to Supreme Court Chief Justices presiding over cases such as Federal Court Appeals,  Death Penalty Appeals, Military trials and State boundary disputes. As stated, the powers that they did or did not have as President of the United States in Congress Assembled are not the issue of this Writ of Mandamus. To illustrate the point of this position let’s examine the Colonial history of the United States and Great Britain. King James I Jamestown Charter began the establishment of the 13 original states as colonies on May 14, 1607. Four years prior to that date, Queen Elizabeth I ruled as one of the most powerful monarchs in the history of western civilization. Elizabeth I has since been followed, 349 years later, by Queen Elizabeth II, who has limited authority when compared to boundless power of her predecessor. The duties and powers of the Crown have dramatically changed since Colonial America. These changes, however, do not connote that Elizabeth II is no longer a Queen of England. Conversely, the ten men who served as Presidents of the United States, in Congress Assembled under the Constitution of 1777 had duties quite different then George W. Bush. George Washington, the First Commander-in-Chief of the United States during the Revolutionary War reported to President of the United States, Samuel Huntington and had duties quite different then George Bush who serves during the War on Terror. Is not George Bush the Commander-in-Chief? Is not Elizabeth the II Queen? Is not Samuel Huntington President of the United States? If he is President does the ambiguous language of the President Coin Act preclude him a coin? It is perplexingly ironic to this Plaintiff that Congress in SEC. 101. FINDINGS, Congress states in (8) “Many people cannot name all of the Presidents, and fewer can name the spouses, nor can many people accurately place each President in the proper time period of American history” in one of its 13 findings and the Secretary argues, on the other hand, the founding Presidents of the United States are excluded from the Act. The Perpetual Union of the United States of America founded by the 13 States under the ratified Constitution of 1777 provided for our Office of President of the United States these men along with their spouses must be so honored in the Coin Act of 2005. In closing, it should be noted that if it were not for Supreme Court Justice Oliver Ellsworth the language in this bill would not ambiguous or be in need of judicial interpretation. It was Governor Edmund Randolph of Virginia who moved to re-name the United States, the “National Government”, in the Constitution of 1787’s Philadelphia Convention. From that point on the term United States replaced National Government in the draft documents. The words, "of America”, were added by Delegate Gouverneur Morris in the final editorial changes of the Constitution of 1787. Had Oliver Ellsworth not been a Delegate to the Philadelphia convention the Constitution of 1787 the convention most likely would have titled the nation, “The National Government of America.” If this occurred then George Washington would have been entitled, rightfully, the first President of the National Government of America. This was not the case and consequently George Washington shares that title President of the United States with the ten men who preceded him under the Constitution of 1777, the Articles of Confederation. The Defendant is wrongfully seeking resolution of the pivotal issue in this case, by skirting the interpretation of the term “president” within the meaning of the Presidential Coin Act, by his motion to dismiss. “The fact that a duty becomes clear only after construction of a statute” does not mean that Plaintiff has not stated a claim for mandamus relief. White v. Matthews, 420 F. Supp. 882, 888 (D.S.D. 1976). See also Carey v. Local Board No. 2, 297 F. Supp. 252, 254 (D. Conn. 1969) (“The fact that a statute may require administrative or judicial construction in order to determine what duties it creates does not mean that mandamus is not proper to compel the officer to perform that duty once it is determined”); and Martinez v. Dunlop, 411 F. Supp. 5, 9 (N.D. Cal. 1976). In this case, in light of the new facts at hand, the Plaintiff respectfully requests the Court to interpret the meaning of the term “president” in the Presidential Coin Act before determining whether mandamus will lie. This issue can not legally and for the sake of these great founding men and women, be determined in the context of a motion to dismiss. The Court is now in an unprecedented situation to hear the evidence and find that the omission of the Constitution of 1777 Presidents $1 Coins is in direct violation of the language incorporated in the 2005 Coin Act Bill. Accordingly, the Defendant’s respectfully requests that the honorable court reconsider the July 14, 2008 Order and so order Motion to Dismiss this Writ of Mandamus should be denied. Smith, Paul H., et al., eds. 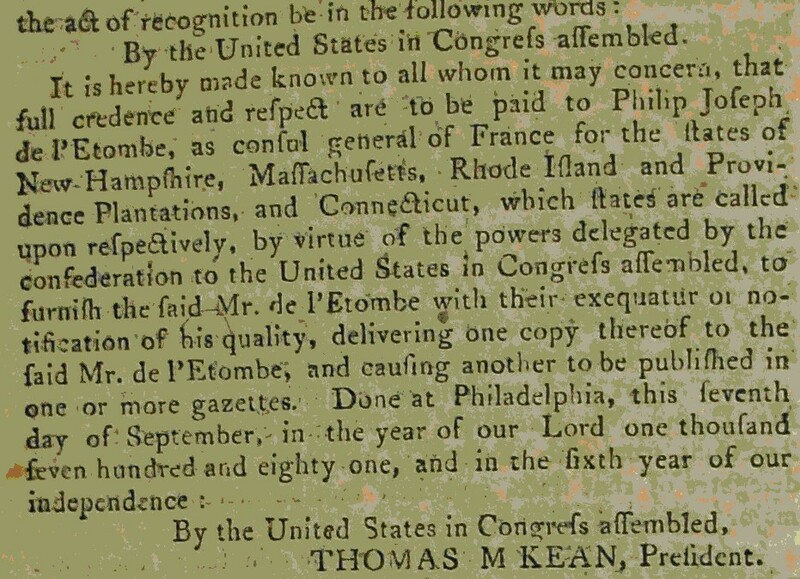 Letters of Delegates to Congress, 1774-1789. 25 volumes, “President Samuel Huntington to Governor Jonathan Trumbull – April 30, 1781 President Hunting ton writes: “I hope, before this, some delegates from Connecticut are on the way to Congress, a I am once more left alone from the state and shall not be able to attend any consid­erable time longer myself.” , Washington, D.C.: Library of Congress, 1976-2000). The plaintiff's "Motion for Reconsideration" (Doc '15) is construed as a motion pursuant to Rule 60(b), Federal Rules of Civil Procedure (1), for relief from the July '14, 2008, order dismissing the complaint with prejudice. The motion fails to show good cause for reconsidering the conclusion that the Presidential $1 Coin Act of 2005 (the "Coin Act")2 neither requires nor authorizes the Secretary of the Treasury to issue a coin bearing the image of each "Constitution of "1777 President;) Tile plaintiff states (Doc. 15 at 8) that although "[a] legislators instinctively know that publicly discussing a measure, let alone introducing an Act, displacing George Washington as the first President of the United States is the true third rail of elective office,” Congress "did the very best politically, they could in the Coin Act of 2005," whose ambiguity (the plaintiff contends) allows a United States District Court to accomplish what Congress was itself unwilling to openly attempt. Even if correct, the plaintiff's theory confirms that the Coin Act imposes no clear duty (3) on the Secretary to issue a coin bearing the image of each Constitution of 1777 President and that the mandatory and declaratory relief requested is unavailable. The motion (Doc. 15) is DENIED. ORDERED in Tampa, Florida, on August 12, 2008. 1. See Teal v. Eagle Fleet Inc., 933 F.2d 341, 347 (5th Cir. '1991); '12 James Wm. Moore et al, Moore's Federal Practice § 59.30 (A motion for reconsideration filed more than 10 days after entry of judgment is treated as a motion seeking relief from judgment under Rule 60(b},"). 2 Pub, L No '109-145, '1'19 Stat. 2664 ("'An Act to Require the Secretary of' the Treasury to Mint Coins in Commemoration of Each of the Nation's Past Presidents and Their Spouses, Respectively, to Improve Circulation off the 51 Coin, to Create a New Bullion Coin, and for Other Purposes."). 3. See Jones v. Alexander, 6•09 F.2d 778,781 (5th Cir. '1980) ("Three elements must exist before mandamus can issue: ('1:1 the plaintiff must have a clear right to the relief, (2) the defendant must have a dear duty to act, and (3) no other adequate remedy must be available. "); Group Health Inc. v. Schweiker, 549 F. Supp. '13S, 14'1 (S.D. Fla. '1982) (same}. 2. ORDER: Denying the Motion for Reconsideration" (Doc '15) construed by the Court as a motion pursuant to Rule 60(b), Federal Rules of Civil Procedure ORDERED in Tampa, Florida, on August 12, 2008. I snarled analyze operate exclusive means straight into imagined functions.